Workplace® Style Guides are a job aid for your desk top or workplace environment. 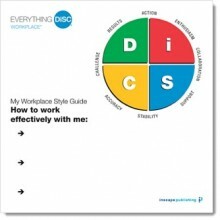 They are intended to be used as follow-up support the DiSC Workplace training. Participants indicate their style on a map, and list ways they prefer to be communicated with. The map can then be displayed in their workplace environment, to encourage more effective, productive working relationships. The Guides are sold separately in sets of 25.